Your black wheelie bin is for rubbish that can’t be recycled and is collected fortnightly. You’ll need to make sure the rubbish is inside the bin with the lid shut. Please don't put rubbish on top or by the side, otherwise we won’t be able to empty it. If you live in a house that has no room for a wheelie bin, you’ll need to use black sacks. These can be readily purchased in all supermarkets and local convenience stores. A new black bin costs £25. If you're in a new home, contact your developer or managing agent as they should provide the bins for you. If you live in a house that has no room for a wheelie bin, you can have a black box for your recycling. A new recycling bin costs £25. If you're in a new home, contact your developer or managing agent as they should provide the bins for you. Please help us to help charities by tying shoes together in pairs and putting everything into the right banks which have been outlined below. Mixed recycling is taken to a Materials Recycling Facility (MRF) in Crayford. Once at Crayford the mixed recycling is sorted into specific categories such as paper, card, glass, plastic, and metals which are baled and ready to then be sent on to suppliers to be made into new products. The rubbish from your black bin is taken to Kent Enviropower in Allington. Here the waste is burnt to create electricity. The food recycling that we collect from resident’s homes is taken to a composting facility in East Malling, where it’s treated at high temperatures to kill any harmful bacteria. It is then used locally on farms as a soil improver. Green waste collected from your garden bin is taken to East Malling for composting. Textiles are recycled by Lawrence M Barry- Textiles can be recycled by placing them in a standard sized carrier bag and presenting them next to your green recycling bin. Please do not put textiles in your recycling bin. Small electrical items are recycled by MDJ Light Brothers Ltd- Residents are able to recycle small electrical items by placing them in a standard sized carrier bag and presenting them next to their rubbish bin. Small electrical items are sent on for recycling and the components are separated and used in manufacturing. To take part simply place your small electrical items into a carrier bag and place this next to your black rubbish bin on your next scheduled rubbish collection. Batteries are recycled by Battery Back PLC- Batteries can be recycled by placing them in a small sandwich bag and leaving them on the closed lid of your grey rubbish bin. Thanks to our residents in 2013-14 we recycled and composted over 46% of our waste and this year the figure is around 50%. Please help us by recycling and composting as much of your waste as you can and help up reach 60% by 2019. A third of the food we buy in the UK gets thrown away. For tips on storing food and recipes for using up leftovers you can visit the Love Food Hate Waste website. If you are a school, community group or run a Cub or Brownie pack, we can give talks and presentations. Topics include recycling, composting and littering. Recycling and composting visits to schools can include a workshop where the children can make models from recyclable materials. If your group would like to organise a litter pick, we can give advice, equipment and even help collect the rubbish. Eco Schools is a programme for schools which aims to raise awareness of sustainable development issues, to find out more you can take a look on the Keep Britain Tidy website. A new food recycling bin costs £8. You can order a new food bin using our online form. 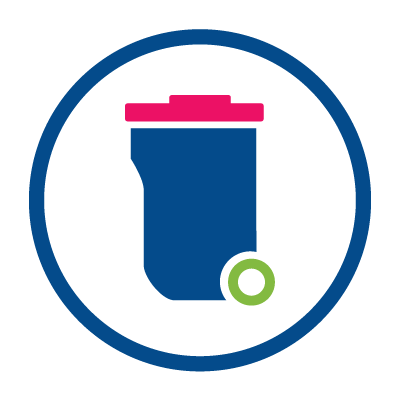 If you're in a new home, contact your developer or managing agent as they should provide the bins for you. You can recycle all food in your food recycling bin and it is collected weekly. Please leave your bin for collection on the boundary of your property for 7am on collection day. Residents can buy a kitchen caddy from most homeware stores or online. Alternatively you can reuse a container, such as an ice cream tub. Do I need to line my caddy? You don’t have to line your kitchen caddy, but if you do please use compostable bags, kitchen roll or newspaper. Liners are made out of potato starch, corn starch or paper and are certified EN 13432. Please don't use plastic bags as they can’t be composted. If you choose to line your caddy, residents are able to purchase liners at a discounted rate from Bio Bag. Click here to purchase. A new recycling bin costs £8. If you're in a new home, contact your developer or managing agent as they should provide the bins for you. We have now started providing brown bins to residents who subscribe to our fortnightly garden waste collection. This is to bring our collections in line with our partners, Ashford and Swale Borough Councils. If you already subscribe to the service you should keep using your green bin with yellow stripe for garden waste. However, if this bin needs replacing in the future due to damage or if it goes missing, a new brown bin will be provided. The year starts from when the bin has been delivered to the property. The smaller bin is only suitable for customers with small gardens or limited space. If you don’t have much room for a garden bin, you could share with a neighbour. You can have more than one garden bin and you will be charged for each one that you have. We won't be able to take your bin if it's too heavy for the crew to move safely, or if the collection vehicle can't pick it up. We no longer collect compostable garden sacks. We have a subscription-only sack service, which is only available for customers who have no room for a garden bin. What if I have no room for a garden bin? If you're assessed as not being suitable for a garden bin you'll be able to have our subscription only sack service. This is only available for customers who are assessed as having no room for a garden bin. This subscription service is £40 a year for up to 52 sacks and are collected fortnightly. You can sign up by calling 01622 602600. Are you moving house or cancelling a bin? If you are moving house or no longer want your bin, you can let us know by using our online form.